We have a new group of map prints from Moda. They have an undeniable charm and some amazing details! Also included in the group is this gorgeous print featuring architectural drawings and blueprints. We have some deliciously springy new cotton lawn at Treadle. This light, soft cotton is easy to sew and dreamy to wear. Use it for skirts, dresses, or blouses, and have fun with details, because lawn is perfect for gathers, tucks, and similar elements that might be too bulk-adding for heavier fabrics. We have some new patterned bottomweight cotton in the store. These heavier fabrics are not just for bottoms; they make great pants and slim skirts but are also perfect for spring jackets and layering pieces. We have several elegant patterns, including these great ikat weave pieces. The ikat weave gives a slightly blurred quality to the pattern for visual softness. Plus there are lots of great florals, botanicals, dots, geometrics, and more! Stop by the store to see the full range! The panel and coordinating prints are shown in a quilt project, Greeting the Moon. Leaflet available at Treadle Yard Goods. Happy St. Patrick's Day from Treadle Yard Goods! You can find this conversation-starting print from Alexander Henry and more in our store! We have loads of new knits in the store! Take a look at these subtly ribbed rayon knits from Land's End. Soft, muted colors combine with the perfect drape to make your ideal spring fabric! Here's a great jacket to inspire your transitional season sewing! Made from Butterick 6142 using two repeats of bordered rayon jacquard, this one-button jacket is a lightweight layering piece to help you welcome spring! 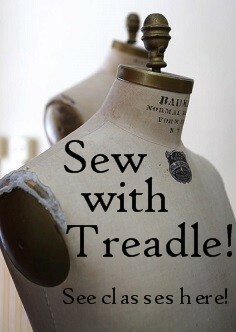 Come find more spring jacket ideas at Treadle! We have some great new additions to our animal print selection from Michael Miller and Alexander Henry, including this wonderful large-scale border print! Add some fun to your sewing with great novelty prints! Spring patterns are in stock at Treadle and we are seeing some fresh, fun looks! Remember, Treadle carries patterns from most major manufacturers at an everyday discounted price! That's right: ALL Vogue patterns are just $12, including designer patterns, McCall's and Butterick are $7.50, and Kwik Sew patterns are just $10. Every Day! That's discounts of up to 40% off! Check out this great knit dress made by Mary. These bright colors are hard to resist! Mary used Butterick 6166 and drapey ponte knit fabric to make this dress. It features a mock wrap front and bold scrunchy midriff detail, and has a tidy bound neckline. Mary omitted the zipper called for in the pattern, saying she had no problem simply pulling this stretchy dress over her head. Come in and find your next project today!